Anyone who has ever worked directly with customers or clients knows that at times, people can be very demanding, ornery, and sometimes, downright nasty in their hostility. Employees often bear the brunt of customers’ anger about the company’s policies, or problems that they personally had nothing to do with. Despite this already challenging work environment, customer-facing roles demand that employees also act as public relations ambassadors, since their behavior often determines how other people view the company brand. So whether you are an account manager, cashier, department manager, or healthcare worker, here are 8 great customer service tips that will help you better connect with the people you serve. This is Customer Service 101. One of the biggest turnoffs for people is when employees don’t listen to their needs, particularly if employees are pushing sales. Great employees recognize that we have one mouth and two ears for good reason. By listening intently, you are far more likely to create a loyal customer. 2. Identify the need or problem. While your job description probably requires you to communicate clearly, you cannot always expect the same from your customers or clients. To help them, you may have to filter some of their irrelevant and confusing talk in order to figure out what they truly need and want. Being patient will be tougher than it sounds. Oftentimes customers, particularly the unruly ones, will try your patience and test your emotions. Outstanding employees recognize that customers’ needs come before their own. They also take the time to listen (Tip #1 above) to their customers’ problems or needs while not letting them take over or dominate the conversation. Try wrapping up the conversation by creating a closing statement that shows you’ve addressed their need directly and specifically. Customers really appreciate this closure, as long as they know their needs will be met. 4. Sharpen your communication skills. This does not just mean speaking clearly, confidently, and cogently, but also includes non-verbal messaging such as facial expressions and body language. Standing up straight, uncrossing your arms, and maintaining eye contact are great examples. These communication skills convey to your customers that they are in caring and capable hands. 5. Know your business and its products. So many people are routinely turned off by employees who don’t know their business or products. The employee who does not have this basic job capability might as well be wearing a billboard sign that says: “I cannot help you.” Being able to answer customers’ questions puts them at ease and builds their trust in your organization. 6. Be prepared for anything. Employees who work directly with customers or clients learn very quickly that each day on the job can be completely unpredictable. You can have many hours go by as smooth sailing, and then all of a sudden all heck breaks loose due to some unforeseen event. Whether it is an angry customer, running out of product, or coworker friction, superior employees are great at rolling with these surprises and challenges. Positivity is literally a magnet for great customer service experiences. A smile goes a long way to creating excellent outcomes. 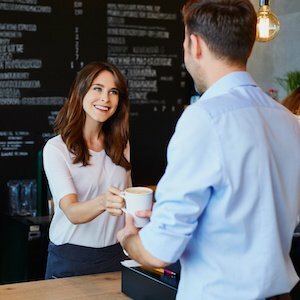 It also reduces the chances that customers will become negative during any part of your interaction with them, because they can tell you have good intentions. No matter how negative customers may be, greet them with professionalism and the aforementioned positivity. Don’t let them rattle you. Keep your cool. You deserve it. Serving others can be very difficult, regardless of the industry. It takes patience, positivity, and the knowledge to solve a variety of challenges. And like most things that are challenging and sometimes unpleasant, it builds character. When you work with difficult personalities, you learn more about the kind of person you want to be—both at work and in your personal life. This entry was posted in Blog and tagged customer engagement, engaged salespeople on July 25, 2018 by Kevin Sheridan.